What do you hang on your door after Christmas has come and gone? A few years ago, I purchased a frosted pale berry wreath. Aside from shedding tiny crystals, it really was the perfect wreath to hang on the door from New Year's Day until the springtime thaw. Somehow this wreath has gone missing in the endless sea of boxes in our attic. We probably will not unearth it until we move. Until then, I am stuck with a naked front door during January, February, and half of March. 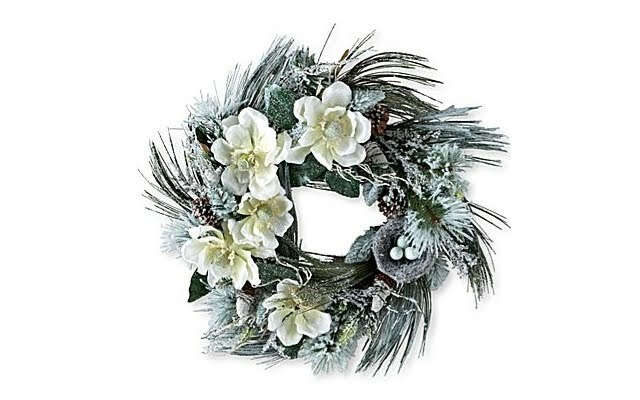 I came across this Snowfall Wreath while browsing online at JCPenney.com . I really think it is a beautiful wintertime wreath that is not specifically for the holidays. It is a generous 26" in diameter and 4" thick, which makes me question whether it would fit between our wooden door and the storm door. It is available online only and is now selling for half price at $39.99 (regularly $79.99). I might just have to stalk this wreath to see if the price goes down a tiny bit more. By then it will probably be springtime, but I will still have it for next winter . . . well, unless we put it in the attic.